Remus (Homepage) wrote: awesome picture! I love the style and very good composition. Tom (Homepage) wrote: Cool abstract shot. Franck (Homepage) wrote: Très graphique. 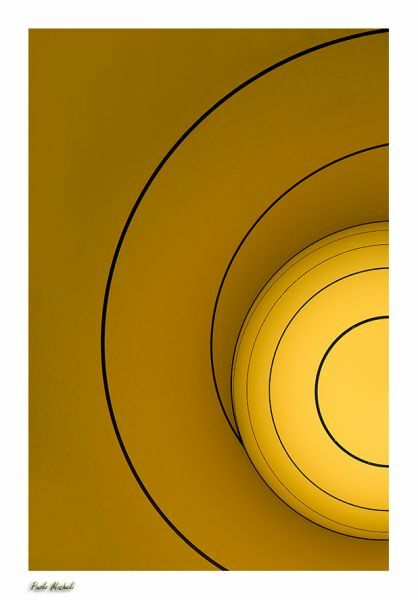 J'aime beaucoup cette couleur jaune, ces cercles concentriques ... Bien vu ! Ilger.nl (Homepage) wrote: Very very cool...and yellow. Can you tell us what it is? mbecher (Homepage) wrote: Whatever it is, it is really beautiful. Great work on the composition. Marhilde (Homepage) wrote: The compositon, the lines, the colors, the tones : great ! Laurie (Homepage) wrote: This is a beautiful composition. Really excellent. Mario Jean [madoc photo] (Homepage) wrote: Image aux qualités graphiques indéniables. J'aime beaucoup. John Maslowski (Homepage) wrote: Impressive colors and tones in this image. The circular lines are mesmerizing, an excellent composition. Luan (Homepage) wrote: Excellent photo. The framing is superb. Simone (Homepage) wrote: Titolo perfetto per uno scatto eccellente...tra i migliori astratti visti di recente...complimenti davvero! Paolo (Homepage) wrote: bellissimo astratto. lampada? Marie (Homepage) wrote: magnifique graphisme, j'aime beaucoup. Beat (Homepage) wrote: Me too, I wonder what it is??. It's very special! Gromitch (Homepage) wrote: Nice lines, nice composition, nice idea of abstraction! Andres (Homepage) wrote: Very original. Is that a lamp??? Terry H. (Homepage) wrote: Oh NO I'm being sucked into the Vortex. Cool Shot!! Caryn Caldwell (Homepage) wrote: Love the colors in this one, and the depth that the lines give it! 613photo (Homepage) wrote: It almost looks like computer generated art or something. It's very cool looking, whatever it is. Great eye for spotting it and I like how you framed it. Phil (Homepage) wrote: Great abstraction and title, I love it! sherri (Homepage) wrote: Wonderful color and lines in this capture.